In 2013, Jeanne d'Moore needed a website that was modern, easy for their customers to use and easy for them to update. They also need a secure online store so they could sell their products online. We were able to build them a fantastic, fast and reliable website and e-commerce solution that was able to achieve everything they wanted and be built on in the future. The website uses a responsive template that allows it to be accessed from smartphones, tablets and desktop PC's, making it more accessible and usable to more devices, which is very important now because there are so many devices out there. The design uses light cream and pink colours with a French flower pattern to symbolise the crafty, vintage nature of the business. The store layout is not as traditional as other stores. The grid layout of the products uses large images rather than a smaller image, product name and add to cart button. This is to take advantage of the beautiful, high quality product images Jeanne d’Moore has. Jeanne d’Moore required a lot of options with their products including different colour, custom shipping for every product and options for customers to enter customisation options for certain products. We were able to accommodate all these options into their products and the store. With unlimited products and categories, hundreds of shipping and payment methods and customisations options for every product our e-commerce solution Jeanne d’Moore with the flexibility so they can sell anything and everything through their online store. 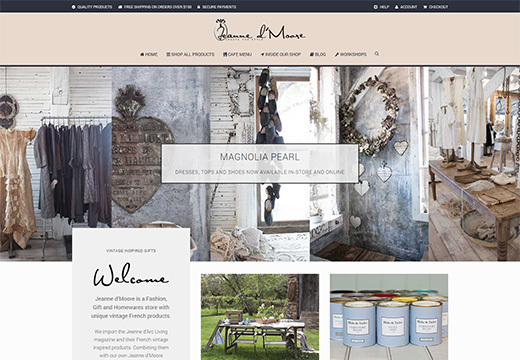 The Jeanne d’Moore website is a great example of how we combine an excellent website design with our e-commerce system and the Joomla! CMS to provide a reliable and secure solution to a business that needs flexibility. In 2015, Jeanne d'Moore's needs had changed. Their online store was working well for them but due to how busy they were they needed someone to manage it. That's where TechCloud Enterprises came into the picture again. We now work with Jeanne d'Moore on a daily basis to keep everything up-to-date, such as product images, descriptions and stock levels, as well as looking at new opportunities and planning for the future, i.e. implement new payment methods like Stripe and managing their Christmas campaign. We also maintain the Jeanne d'Moore social media accounts (Facebook, Twitter, Pinterest and Google+) so we can grow their business online. We even provide them with onsite training and equipment to assist them in growing and managing their online store.